The world is in the midst of a tall building boom where skyscrapers are defining the prosperity of modern metropoles. These towers come in all kind of forms with facades in all kinds of glazed material. But scratch below the surface, and you will find the same steel or concrete structure that supported the first skyscrapers in 19th century New York and Chicago. - Timber construction can lead to shorter construction programmes due to offsite prefabrication. It has good thermal and fire performance properties and results in lighter buildings’ requiring smaller foundations. The sustainability benefits often makes it possible to create a carbon neutral structure”. - CLT boasts many material benefits, not least its sustainability. In total, Dalston Lane will save 2,400 tonnes of carbon, compared to an equivalent block with a concrete frame. By using a CLT construction in the Dalston Lane project, the embodied carbon is 2.5 times less than that of an equivalent concrete frame. Taking into account that timber stores carbon by absorbing carbon dioxide (CO2) from the atmosphere, also known as ‘sequestered or embodied carbon’, the Dalston Lane structure can be considered as ‘carbon negative’. Its 3,852 cubic metres of CLT will form the external, party and core walls, floors and stairs. - In a world where sustainability is ever critical, this truly viable construction material is one we need to embrace, Gavin White says. With an increasing number of the world’s population moving to central locations in capitals and cities, there is a growing need for densification as space becomes increasingly limited. But in the world’s developed cities, increased densification can pose significant challenges as these cities boast a myriad of underground infrastructure that supports the mobility of the city. This is where the weight of timber can bring significant value to a development. - The light weight of timber makes it possible to increase the height of a proposed development because it exerts less load onto the underground infrastructure. It also enables developments, where previously not thought possible, as the lighter building can be built on shallower foundations, Gavin White explains. 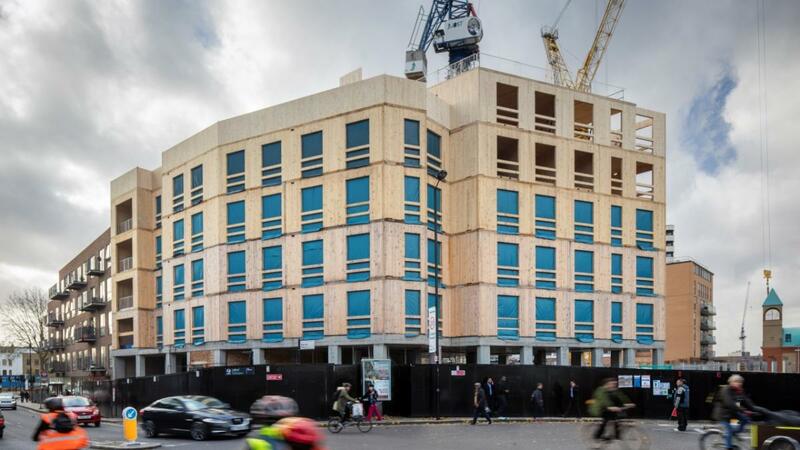 With London’s High Speed 1 and Crossrail passing under the building site of the Dalston development, the choice for CLT was unequivocal with its lighter construction weight that enabled smaller foundations and a further two stories of accommodation on to the building.